Eosinophilic esophagitis is a chronic immunoallergic inflammatory disease of the esophagus that represents a major cause of digestive morbidity among the pediatric and young adult populations. Despite the fact that key symptoms in adults include dysphagia and food impaction, many patients lack structural changes in the esophagus to account for their complaints, which suggests the presence of underlying motor disorders and esophageal distensibility impairment. 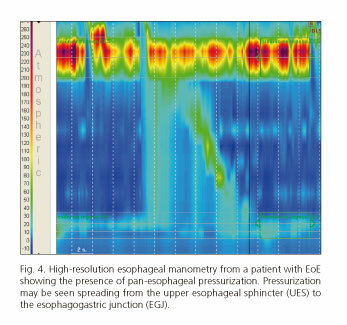 In the last few years the esophageal motility of these patients has been studied using various approaches, most particularly high-resolution manometry, ambulatory manometry, and impedance planimetry. 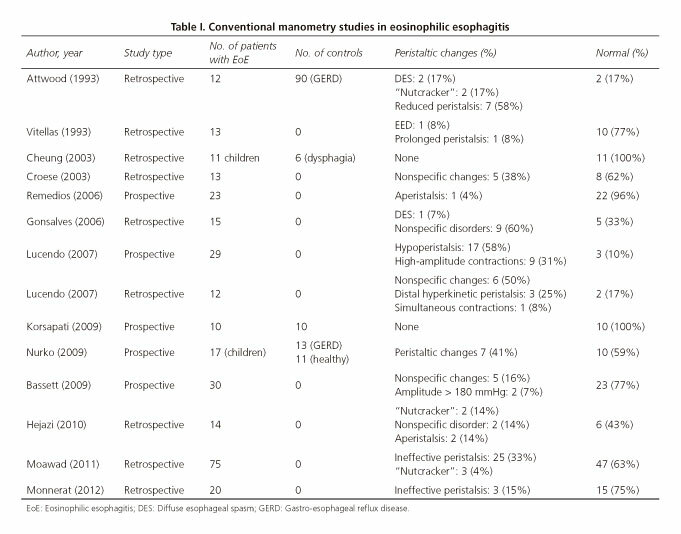 This review focuses on the most relevant findings and scientific evidence regarding esophageal motor disorders in eosinophilic esophagitis. Key words: Eosinophilic esophagitis. Esophageal motility. Esophageal distensibility. High-resolution manometry. Ambulatory manometry. Impedance planimetry. La esofagitis eosinofílica es una enfermedad inflamatoria crónica del esófago con una base inmunoalérgica que representa una de las principales causas de morbilidad digestiva en la población pediátrica y adulta joven. A pesar de que sus síntomas principales en adultos son la disfagia y las impactaciones alimentarias, gran parte de los pacientes no presentan alteraciones estructurales esofágicas que justifiquen estos síntomas, lo que sugiere la presencia de trastornos motores y alteraciones de la distensibilidad esofágica subyacentes. En los últimos años se ha estudiado la motilidad esofágica de estos pacientes mediante diferentes métodos, entre los que destacan la manometría de alta resolución, la manometría ambulatoria y la planimetría por impedancia. Esta revisión recoge los hallazgos más relevantes y la evidencia científica más destacada acerca de las alteraciones motoras esofágicas en la esofagitis eosinofílica. Palabras clave: Esofagitis eosinofílica. Motilidad esofágica. Distensibilidad esofágica. Manometría de alta resolución. Manometría ambulatoria. Planimetría por impedancia. Eosinophilic esophagitis (EoE) is an immune-mediated chronic inflammatory disease that results from antigen exposure and is characterized by esophageal dysfunction symptoms and esophageal mucosal infiltration with eosinophils (1). Both its incidence and prevalence have increased in the last few years, and the condition has become a major cause of digestive morbidity. It is currently the second cause of chronic esophagitis among children and young adults, after gastro-esophageal reflux disease (GERD) (2,3). EoE-related clinical manifestations vary according to age (4). Among the pediatric pupulation, symptoms are usually nonspecific and may include food rejection, failure to thrive, irritability, vomiting and/or abdominal pain (5-7). Among younger adults primary symptoms include dysphagia, usually intermittent and unpredictable, and food impaction (4,8). Less common complaints include heartburn, regurgitation and chest pain, which may on occasion mislead towards GERD (9,10). Furthermore, as this condition has an immune and allergic background, patients frequently exhibit comorbid atopy, asthma, and food allergies (11-13). The diagnosis of EoE relies on clinical suspicion and requires histological confirmation. Currently accepted criteria include: Esophageal dysfunction symptoms, presence of at least 15 eosinophils per high power field (HPF) in esophageal biopsy samples, eosinophilia limited to the esophagus, and ruling out other causes of esophageal eosinophilia. GERD and PPI-responsive esophageal eosinophilia (PPI-REE) should be highlighted among the latter (14,15). PPI-REE is characterized by manifestations and histological features that overlap with those of EoE but that, in contrast, completely resolve under treatment with proton-pump inhibitors (PPIs). While PPI-REE was initially considered a distinct condition, present evidence reveals that both entities are both genetically and phenotypically indistinguishable, hence some authors suggest they might represent different phenotypes of only one process (16,17). Several characteristic endoscopic findings have been identified in patients with EoE, including longitudinal furrows, rings, trachealization, white exudates, reduced esophageal distensibility, and mucosal frailty (9,18) (Fig. 1). However, during endoscopy, most subjects have no anatomical changes to account for their dysphagia and food impaction, which suggests the possibility of motor disorders underlying patient complaints (19). While knowledge is limited on the pathogenesis of EoE, several pathophysiological mechanisms involved in esophageal motility impairment have been identified (20). Eosinophils infiltrating the esophageal mucosa play the most significant role, and exert several actions through mediators. Interleukin 5 (IL-5) is involved in eosinophil proliferation, maturation, and release, as well as in the induction of tissue remodeling (21,22). During the inflammatory response, eosinophils become activated and exhibit degranulation, thus releasing cytotoxic proteins that directly damage the mucosa. These include the eosinophil major basic protein, with the ability to activate muscarinic M2 acetylcholine receptors, which are responsible for smooth muscle contraction at the distal two thirds of the esophagus (5). Some proinflammatory cytokines have also been detected in the circular muscle fibers of the esophagus, including interleukin 6 (IL-6) and interleukin IL-1beta (IL-1β). These would contribute to the reduction of esophageal contraction by inhibiting acetylcholine release in myenteric neurons (23). Studies on fibroblast and eosinophil cultures have shown that fibroblast contractions increase through mediation by TGF-beta (TGF-β) (24). Finally, fibrosis secondary to eosinophil-mediated chronic inflammation may be responsible not only for esophageal wall rigidity but also contractile dysfunction (25). The primary function of the esophagus is to facilitate the passage of the food bolus from the oral cavity into the stomach, which takes place through a number of closely coordinated neuromuscular mechanisms called peristalsis. The esophageal motor function was initially studied with radiographic and endoscopic procedures, but these only allow a qualitative assessment, are irreproducible, and are notorious for high interobserver variability (26,27). Esophageal distensibility is the property that allows esophageal widening as a result of intrabolus pressure. It is defined as the change in cross-sectional area at the narrowest esophageal region by intraluminal pressure unit. Esophageal distensibility may be collected with endoscopy, fluoroscopy, barostat and/or impedance planimetry (26). 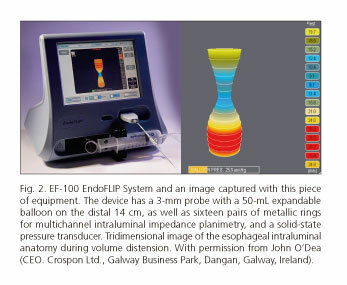 The use of the FLIP (Functional Luminal Imaging Probe) system has been suggested of late, which uses high-resolution impedance planimetry to generate a tridimensional image of the intraluminal esophageal anatomy during volumetric distension (25). It also allows quantitative measurements, hence a more objective measurement of tissue remodeling and fibrosis (27). The device (EndoFlip) consists of a probe 3 mm in diameter, with an expandable 50-mL balloon coupled with the distal 14-cm segment, as well as sixteen pairs of metallic rings for multichannel intraluminal impedancemetry and a solid-state pressure transducer (Fig. 2). A prospective case-control study by Nicodème et al. 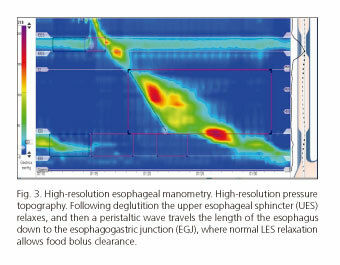 (28) assessed the correlation between esophageal distensibility as measured by high-resolution impedance planimetry and susceptibility to food impaction and/or need for esophageal dilation. They also compared esophageal distensibility to eosinophilia levels at the esophageal mucosa. They selected 70 patients with food impaction, dysphagia, chest pain, heartburn, and at least 15 eosinophils per high-power field (HPF) in esophageal biopsies. A control group was included with 10 healthy patients without esophageal eosinophilia. Cases were initially subjected to a course of double-dose PPIs, followed by a second endoscopic procedure with biopsy taking. Eosinophil count per HPF stratified cases in 49 subjects with EoE (> 15 eosinophils per HPF) and 21 subjects with PPI-REE (< 15 eosinophils per HPF). In a second phase cases and controls underwent high-resolution impedance planimetry, and follow-up for 12 months. Reduced esophageal distensibility was found in patients with EoE and PPI-REE as compared to controls. An association between reduced distensibility and food impaction (whether prior or during follow-up) was also found. However, no correlation could be discerned between esophageal distensibility and eosinophil infiltration extent. The authors concluded that reduced esophageal distensibility (< 225 mm2) in patients with EoE is a fine risk predictor for food impaction and need for dilation. In contrast, eosinophil infiltration extent is not predictive of outcome, and correlates poorly to esophageal distensibility. To sum up, patients with EoE exhibit reduced esophageal distensibility likely secondary to esophageal wall thickening, edema and fibrosis (26,28). Conventional manometry is the modality initially used in the study of dysphagia and motility changes in patients with EoE. Since 1997, multiple papers on conventional manometry have described distinct motility patterns in these patients, ranging from normal esophageal peristalsis or nonspecific changes to specified motor disorders such as achalasia, diffuse esophageal spasm or nutcracker esophagus (Table I). Nurko et al. (29) found motility changes in 41% of subjects, most of them nonspecific. The wide range of motor changes in patients with various ages suggest that disease duration may condition the type of motor disorder present, progressing from hypercontractile to hypocontractile patterns over the years (23,29). Conventional manometry has now been left behind by more accurate methods such as high-resolution manometry (HRM). Significant advances have been recently made in the study of esophageal motor disorders because of the development of high-resolution manometry (HRM), which relies on a number of close-coupled sensors that, through interpolation, may measure intraesophageal pressure changes and convert them to temporo-spatial images (Fig. 3). The term high-resolution esophageal pressure topography was coined to refer to this manner of temporo-spatial representation of the data provided by HRM (30,31), which allows a simpler, faster analysis versus conventional manometry because of more reproducible studies with less interobserver variability (31-33). Two high-resolution manometry systems are currently available -solid-state high-resolution manometry (sHRM) and perfusion high-resolution manometry (pHRM). sHRM uses catheters with electronic pressure sensors or inner transducers. Currently, sHRM devices consist of 36 circumferential sensors that provide rapid response rates and allow a detailed study of the upper esophageal sphincter (UES) and the EGJ. Normal values as established by the Chicago Classification were defined using sHRM (34-36). pHRM has the advantage of a more durable probe. Of late, 36-channel perfusion catheters have been developed, which obtain pressure profiles with improved quality and accuracy (37). However, perfusion catheter accuracy is inferior to that of sHRM in the study of the UES. In recent years esophageal motility in patients with EoE was also assessed using HRM, and findings are summarized in table II. At Hospital Universitario de La Princesa (Madrid, Spain), Martín et al. (19) carried out a prospective, case-control study where 21 subjects with EoE and 21 controls with gastroesophageal reflux manifestations not meeting EoE criteria were enrolled. All underwent HRM, and an association between pan-esophageal pressurization and a history of endoscopic disimpaction was found among subjects with EoE (p = 0.04) (Fig. 4). An association between pan-esophageal pressurization and disease duration longer than ten years was also found, but statistical significance was not reached. The authors conclude that the motor disorder most commonly found in EoE is pan-esophageal pressurization, and its presence in patients with a history of impaction with no structural changes is highly suggestive of this condition. Recently, van Rhijn et al. (24) carried out a prospective case-control study to assess the relationship between clinical characteristics of patients with EoE, manometric patterns, and disease duration. A total of 31 patients with a diagnosis of EoE and dysphagia complaints, 31 controls with gastroesophageal reflux symptoms, and 31 healthy controls were included. All of these underwent solid-state, 36-channel HRM. The EoE group had reduced peristalsis in 27% of patients, interrupted peristalsis in 12%, and intact contraction in 61% (p < 0.001). A higher prevalence of motor disorders was also seen in parallel with disease duration (36% from 0 to 5 years, 83% for over 16 years). They conclude that EoE duration is a risk factor for the development of motor changes, with interrupted peristalsis and weak peristalsis being most common (Fig. 5). However, no manometric pattern specific for EoE has been thus far identified, hence HRM is considered to be neither necessary nor indicated to establish a diagnosis of EoE. The musculature on the distal two thirds of the esophagus consists of two smooth muscle layers, an inner layer with circular fibers and an outer layer with longitudinal fibers. In healthy individuals both layers are perfectly synchronous during peristalsis, and facilitate the propulsion of the food bolus along the esophagus (38). During deglutition a normal shortening of the esophagus may result from the contraction of longitudinal fibers, and the esophago-gastric junction (EGJ) is offset one or more centimeters cephalad above the diaphragmatic hiatus; however, under the elasticity inherent to the phrenoesophageal membrane, the EGJ returns to its normal position under the diaphragm when deglutition ends. 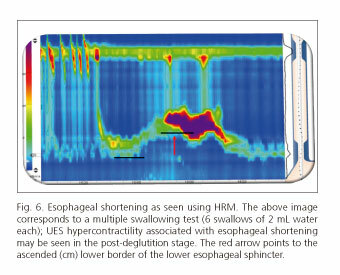 The contraction of the esophageal longitudinal muscle layer shortens the esophageal body, which may be easily measured with high-resolution manometry (Fig. 6). The asynchronicity of muscle layers in the esophagus was described in patients with nutcracker esophagus (39), which led to investigate this issue in patients with EoE. Studies have been carried out to assess each muscle layer, the inner one using manometry and the outer longitudinal one using endoscopic ultrasonography (EUS) (40). Korsapati et al. performed a prospective study (41) to evaluate the interaction of both muscle layers in patients with EoE. To this end they selected 10 cases and 10 healthy controls who simultaneously underwent EUS and conventional, 8-channel manometry. Measurements were obtained before and after the administration of intravenous edrophonium. 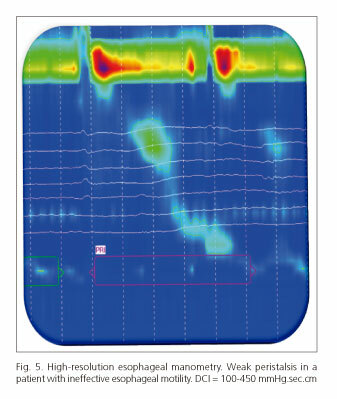 No differences in manometric pressures were found during peristalsis when assessing the circular layer with manometry. However, in patients with EoE asynchronicity was found between contractions of the circular and longitudinal muscle layers during peristalsis at the expense of longitudinal layer dysfunction. The authors suggest that this selective longitudinal layer impairment may contribute to dysphagia in EoE. The pathophysiology of this selective dysfunction in the outer muscle layer remains unknown. The authors posit the hypothesis that it may result from the impact of fibrosis on longitudinal fibers, which would preclude esophageal shortening along that axis. They also suggest that abnormal longitudinal contraction would be followed by abnormal muscle relaxation, which imaging studies might reflect as esophageal stenosis. Several pathogenic mechanisms have been proposed, but no studies are available on the longitudinal muscle layer of the esophagus (42). The fact that EoE-related dysphagia is intermittent may entail that associated motor disorders will not manifest during the recording period of stationary HRM. On these same grounds, no correlation between symptoms and motor disorders may be established with a cross-sectional study (29,43,44). These issues were approached in a paper by Nurko et al. (45) on a pediatric population where a total of 41 individuals were assessed: 17 patients diagnosed with EoE, 13 with GERD, and 11 healthy controls. They all underwent both stationary HRM and ambulatory esophageal manometry plus pHmetry for 24 hours. Only 41% of patients with EoE has peristaltic changes during HRM. During ambulatory manometry plus pHmetry 76% of patients with EoE had dysphagia, with motor changes acknowledged in every event: 90% non-peristaltic contractions, 90% isolated or repeated contractions, 70% contractions above 170 mmHg, and 41% multiple peak contractions. Ineffective peristalsis was particularly common when swallowing during meals. The authors conclude that in a pediatric population with EoE dysphagia does correlate to manometric changes consisting of a higher number of ineffective peristaltic waves, higher-amplitude peristalsis, and isolated contractions. To which extent the above EoE-related changes may be reversed with therapy remains unknown, and further manometry studies are needed to assess the response of motor disorders to treatment. - Dysphagia and food impaction are the primary symptoms of EoE and result more commonly from esophageal motility and distensibility disorders than from anatomical changes identifiable by endoscopy or imaging techniques. - Eosinophil degranulation within the esophageal mucosa is the main driver in the pathogenesis of EoE. - In patients with EoE, esophageal distensibility, as measured with impedance planimetry, is reduced, which represents a good risk predictor for food impaction. - Motor disorders as seen in EoE may possibly progress from hypercontractility to hypocontractility disorders. - Endoscopic ultrasonography has revealed a selective longitudinal muscle dysfunction in EoE, which may play a relevant role in the dysphagia experienced by these patients. - High-resolution manometry has allowed to define the motility changes most commonly found in EoE, their prevalence increasing with disease duration. However, no specific manometry pattern has been identified for EoE, hence HRM is not considered a diagnostic test for this disease. - Ambulatory manometry has demonstrated a temporal association between dysphagia and motor disorders.